Admittedly, it may be a bit early to begin thinking about buying sandals, since the high in New York today is 40 degrees. 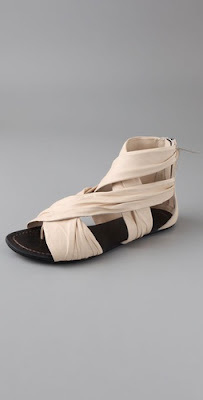 But the second I spotted the Joe's Jeans Monroe Draped Flat Thong Sandals on Shopbop ($165), I was hooked. The intricate crisscrossing straps, the lush wrinkled leather, the chic flat silhouette, the cool zipper detail up the back ... all add up to one pretty hot shoe.